Paramedics attend to the baby girl after she was rescued. We kept praying for her and God answered. "To be found alive and well, crying and in good spirits, I really do think it's a miracle". PR councillor, Shotel De Boer with residents. "Rescue efforts are underway try to rescue it", he said. Rescue teams secure a trench in order to reach a newborn baby that was presumably dumped down a stormwater drain in Newlands East on Monday. "To see that baby, I had tears in my face", one man said. 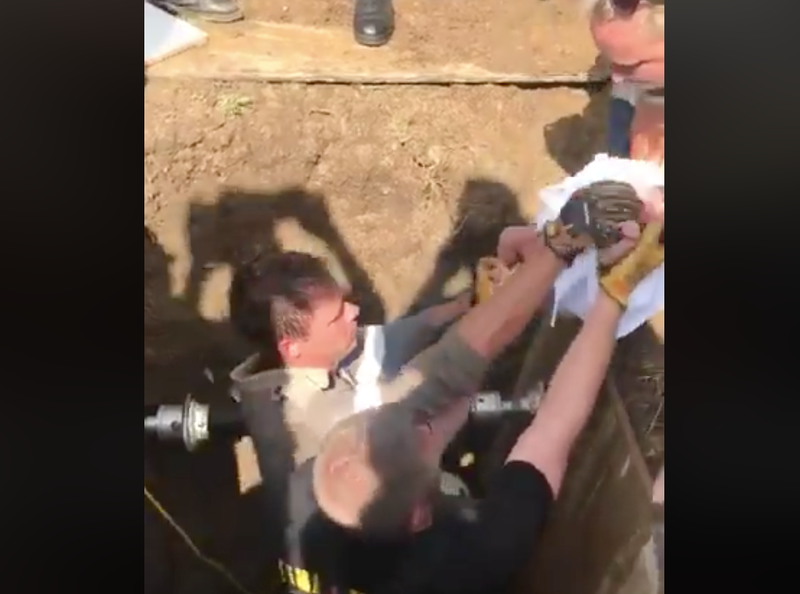 Bernadette Wicks, a reporter for a local news outlet, said that people had provided doors from their kitchen cupboards to help workers hold back earth as they attempted to remove the baby from the pipe. "We thank God for her". The newborn, which doctors believe is no more than three-days-old, was freed from the drain on Monday morning after passersby heard her crying. Some community members have named the baby girl, 'Storm'.